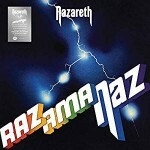 Share the post "Album review: NAZARETH – coloured vinyl (reissues)"
Scottish rock band Nazareth have produced some of the finest hard rock these shores have known since their 1971 debut, and although the material has been reissued on numerous occasions (most recently the Back In Black coloured vinyl issues, which attached to no other particular campaign), the original vinyl is still very collectable, and all have been long unavailable. On the back of the recent ‘Loud And Proud’ box set (32 CD, 2 double LP, a single LP, a picture disc, 3 * 45 and a book), which is probably the best reissue I’ve ever been involved with, these albums get the works. With picture labels and coloured vinyl, the packaging replicates the original UK release, and on heavy weight vinyl. They look and feel as good as they sound. Amazing. I have to admit that these six albums, all dating from the 70s, are Nazareth’s finest. They’ve made some wonderful albums since, but these ones each set a bar that few could match. Ever. With their roots in the 60s Ballroom top 40 cover band The Shaddettes, who worked hard around the Fife area of Scotland, the band formed in the late 60s and featured vocalist Dan McCafferty, guitarist Manny Charlton, bassist Pete Agnew and drummer Darrell Sweet. After two albums on the Pegasus label, and tours supporting the likes of Atomic Rooster and Deep Purple, the band signed to Mooncrest in 1973 and, with Deep Purple’s Roger Glover on board as producer, the band released the classic Razamanaz. From the blistering punch of the guitar on the title track, to the two hit singles ‘Bad Bad Boy’ and ‘Broken Down Angel’, it’s one of those albums that hits such a high mark, the chemistry and Zeitgeist all hitting bullseye. There’s slide guitar, a blues rock influence (and the more trad blues ‘Woke Up This Morning’ rerecorded from the previous album), McCafferty’s gravelly whiskey soaked vocals, this album really is it. Loud’n’Proud, also produced by Glover and released the same year, is just as good, but was always lived in the previous album’s shadow, ‘Teenage Nervous Breakdown’ an uptempo rocker, and the single ‘This Flight Tonight’ a cover of the Joni Mitchell track that Mitchell herself was impressed with. 1974’s Rampant was the last produced by Glover, and featured Purple pianist Jon Lord as a guest. ‘Shanghai’d In Shanghai’ is a standout, and there’s a cracking cover of the Yardbirds’ ‘Shapes Of Things’. The original UK issue with a large dollar bill stylised sticker with the track listing. This replicates it stuck on the rear, which is how you’ll find most original LPs. If you can find one in mint condition with the sticker as an insert, still unstuck/unused, it’ll set you back £100+. The following year the album Hair Of The Dog (the first to be produced by guitarist Manny Charlton) cemented international success, with no small part played to the non-album single ‘Love Hurts’, a cover of the Everly Brothers song recorded during the album’s sessions. Again the original pressing of the album is a rarity, so to have the inner sleeve here is nice. After moving from Mooncrest to the Mountain label, skip forward a couple of years, after Nazareth had released a couple of less punchy albums (not a wise move during the rise of punk), the band’s energy returned with 1977’s Expect To Mercy. “A bit more metal”, as Manny Charlton once told me. Lovely Frank Frazetta artwork you can’t appreciate on the CD format, and true to the UK original, there’s an inner sleeve, and also the UK variant of the two logos used. Some great tracks, the title track a firm favourite. Finally, in this run, is 1979’s No Mean City. This was my first Nazareth album, bought on account of the artwork. This led to me running the band’s fanclub, and also becoming good friends with sleeve artist Rodney Matthews. The artwork was inspired by the title track, a track based on the 1935 novel of the same name, with a plot centred around a rough area of Glasgow and the hard razor gangs of the period. One of the band’s heaviest and best albums, bolstered by the addition of Sensational Alex Harvey Band guitarist Zal Cleminson. More artwork best appreciated on LP, and again the inner sleeve. Lovely. All these LPs are solidly and lovingly packaged, the vinyl is heavy, the sound is excellent. Even for the average classic rock fan, these are essential, they feel as good as they look and as good as they sound. And to be treasured by a more ardent fan of Nazareth, of classic rock and of vinyl. This entry was posted in ALBUM REVIEWS, ALBUM REVIEWS (Mobile), All Posts, Reissues and tagged album, blues rock, BMG, Classic Albums, classic rock, coloured vinyl, Dan McCafferty, Nazareth, Pete Agnew, re-issue, review, rock. Bookmark the permalink.